TechWomen 2015: The TechWomen 2015 year has started! Professional and Cultural mentors for the 99 Emerging Leaders from 19 countries who will participate in the five-week program are being notified of acceptances. I have been honored to be selected as a Cultural Mentor for the South Bay Area in the Arts & Culture group. I am looking forward to working with Emerging Leaders and other mentors in the Silicon Valley. 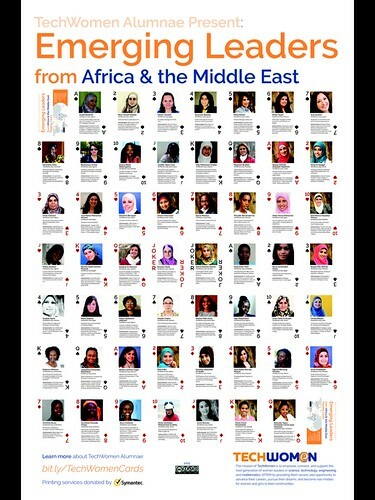 Since 2011, 156 women from Algeria, Cameroon, Egypt, Jordan, Kenya, Lebanon, Libya, Morocco, Nigeria, Palestine, Rwanda, Sierra Leone, South Africa, Tunisia, Yemen, and Zimbabwe have participated. The 2015 TechWomen program will expand to include women from Kazakhstan, Kyrgyzstan, Tajikistan, Turkmenistan, and Uzbekistan. 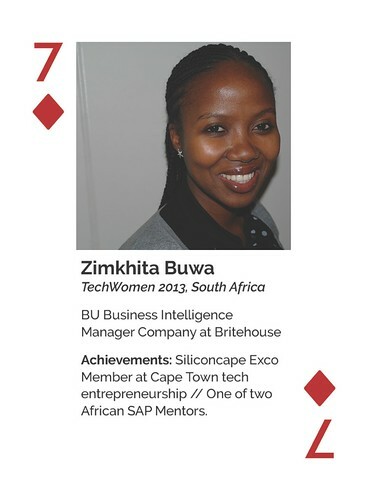 This year, my company Mentoring Standard will be offering training and certification for TechWomen mentors. Our Team is now developing those materials. We are very much looking forward to supporting this outstanding program of citizen diplomacy by the US Department of State – Bureau of Educational Cultural Affairs. 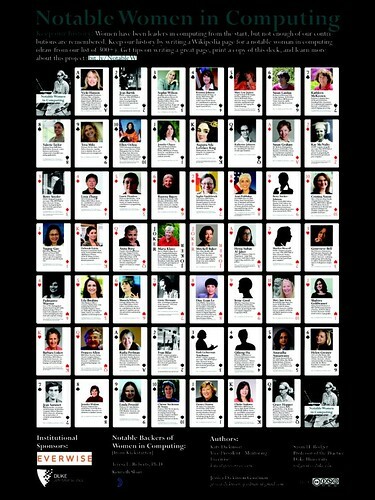 Notable Technical Women: The Notable Technical Women project by Jessica Dickinson Goodman (California Department of Justice), Dr. Susan Rodger (Duke University), and me is also thriving: Jessica just placed a big re-order of the Notable Women in Computing card decks and posters, and the TechWomen cards and posters continue to sell steadily. 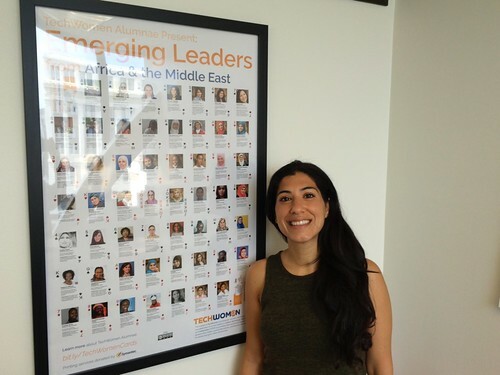 TechWomen Director Arezoo Miot is pictured above with the TechWomen poster in her Institute of International Education office in San Francisco. Want to write for Wikipedia? We welcome corrections and additions to information on the Notable Technical Women materials. Since the first printing in November 2014, eight honorees have had new Wikipedia biographies written (or we found pages about them): Clarisse Sieckenius de Souza, Laurie Hendren, Kathleen McKeown, Betty Snyder (aka Betty Holberton), Valerie Taylor, Marlyn Wescoff (aka Marilyn Meltzer), Linda Petzold, and Lixia Zhang. There are only six Notable Technical Women honorees left (out of the 54 honorees) who need biographies written: Anuradha Annaswamy, Chieko Asakawa, Qiheng Hu, Yuqing Gao, Lila Ibrahim, and Sophie Vandebroek. We update the cards as possible between printings. 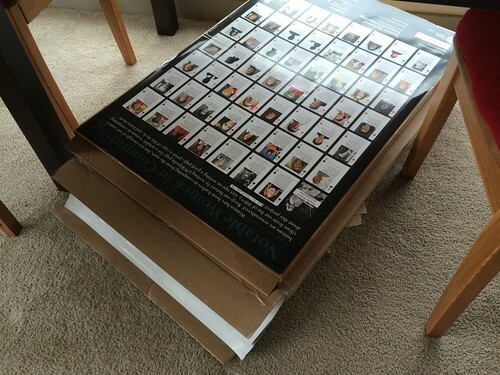 As of January 2015, these cards and posters are available for sale on Notable Technical Women. 54 Notable Women in Computing who are pioneers or have received multiple, high-level awards from more than one institution (such as being named an ACM Fellow, IEEE Fellow, elected to a National Academy, or receiving the Turing Award). 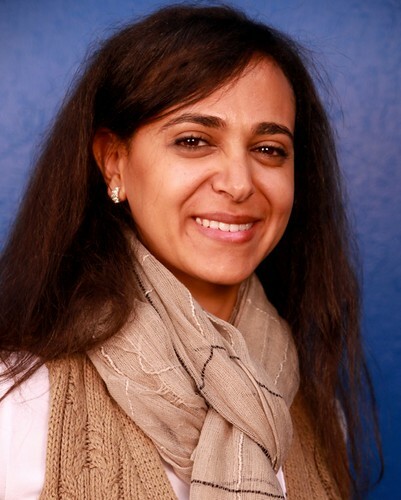 54 TechWomen Emerging Leaders (2011-2014, from 16 countries in the Middle East and Africa) – alumnae of the US State Department, Bureau of Educational and Cultural Affairs mentoring program hosted in Silicon Valley annually. 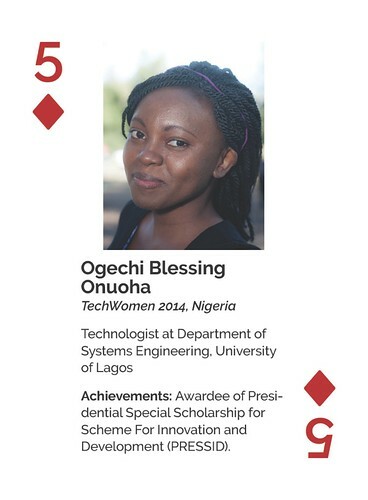 “Notable Women in Computing” has also inspired many daughter projects – including the “TechWomen Emerging Leaders” poster and card decks (for which Jessica was also the designer!) 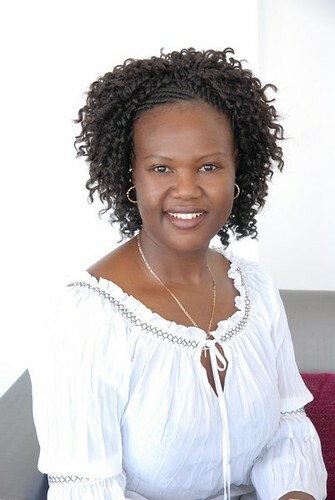 – now in production to go to South Africa for the TechWomen Delegation next week. Mentors give recommendations to resources. Mentors give feedback for the mentee to consider. 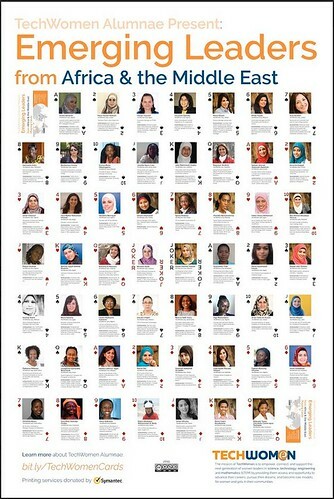 I am lucky to know many of the 108 women honored here personally. My respect for this group could not be higher. Most of the “Notable Women in Computing” group have been role models and mentors to generations of students and rising professionals. When I have served on the selection committees for TechWomen Emerging Leaders, one of the most common hopes I read in their application essays is for an opportunity to give back to their community and to help girls learn to use and love technology. I have also heard this aspiration over and over from my own amazing TechWomen mentees. Please help spread the news of these amazing technical leaders. In August 2013, I wrote about Getting Beyond Marie Curie – developing information and awareness about other great women tole models. Here are 108. 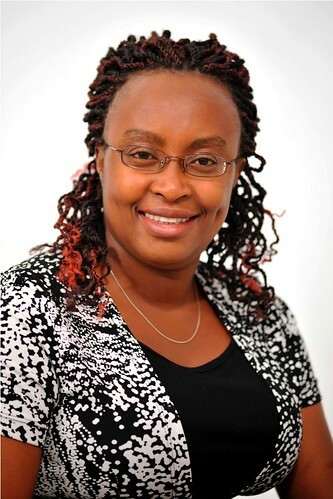 Thanks to Eileen Brewer, Symantec is donating the printing for the first edition of the “TechWomen Emerging Leaders” poster – enough for us to take on the South Africa Delegation later this month! Thanks also to Jessica Dickinson Goodman (my capable and talented daughter) for designing the poster and cards. And, of course, thanks to the 54 TechWomen Emerging Leaders from 16 countries in Africa and the Middle East for being our amazing honorees! 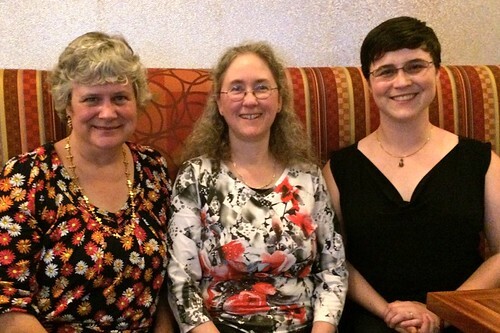 I am proud and honored to work with some of the most intelligent and accomplished technical women there are. 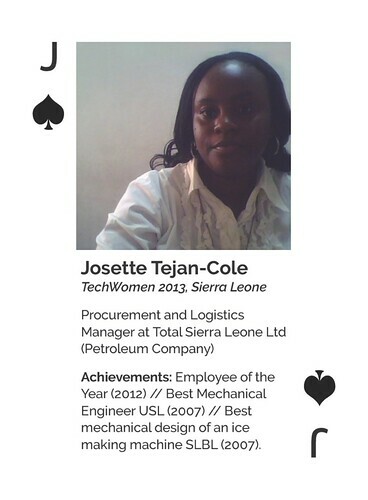 As of January 2015, these cards are available for sale on Notable Technical Women. We welcome financial backers! If you would like to join us in supporting this inspiring project, please contribute here. 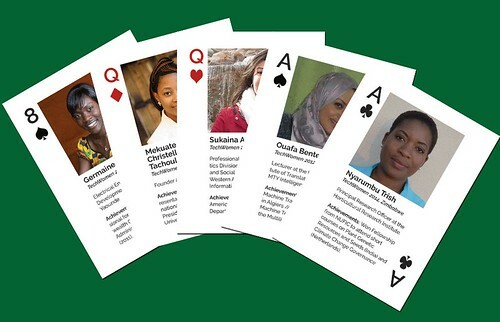 If we do not collect enough money to produce card decks in time for the TechWomen South Africa Delegation at the end of January 2015, we will prepare a poster featuring the cards to take to South Africa, then focus on getting funding for producing the playing cards to take on the Tunisia Delegation in mid-March 2015. 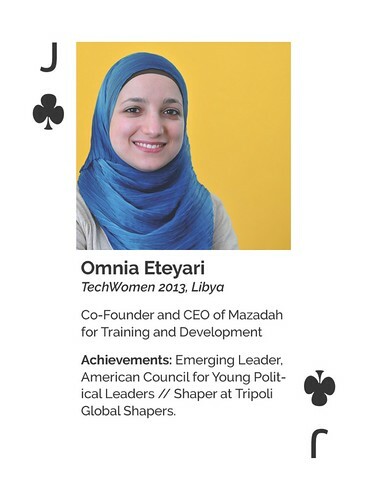 The “TechWomen Emerging Leader” poster will be inspired by the “Notable Women in Computing” playing cards and poster project in content and design. This project is a labor of love for the women behind it, which is why we are licensing it under Creative Commons Attribution-NonCommercial-ShareAlike 3.0 U.S. License. We will make $0 profit from this project. Here are the names and card assignments of the honorees. There may be text edits before production starts – space is very limited on playing cards! Jessica is creating the card and poster designs now – a sample card hand is above. 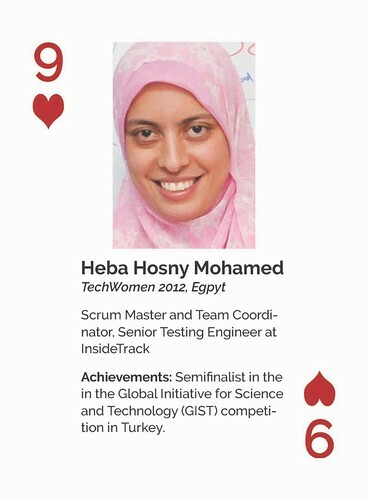 ❤ 9- Heba Hosny Mohamed (2012) Egypt Scrum Master/ Team Coordinar, Senior Testing Engineer, at InsideTrack Semifinalist in the in the Global Initiative for Science and Technology, GIST, competition in Turkey. 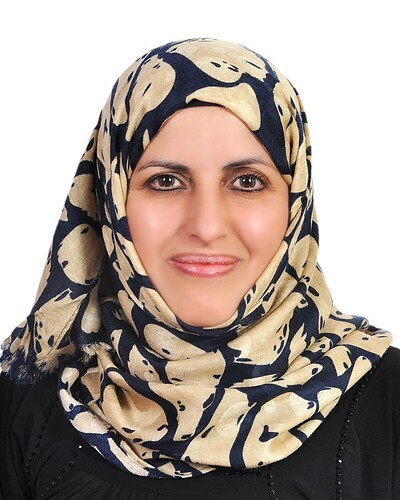 ♦ 10- Rokia Abubaker Mohammed Al-beity (2014) Yemen HSE & Security specialist / Baker Hughes Interpries – Yemen . 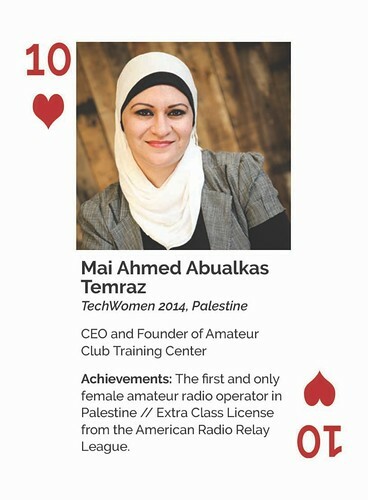 TechWomen Mentor Eileen Brewer, Jessica Dickinson Goodman and I are partnering with Arezoo Miot (IIE TechWomen Director), Jill Finlayson and Julia Lovin (Council Co-Chairs of the TechWomen Alumnae Organization, and TechWomen Mentors) to create a new playing card deck honoring 54 of the remarkable TechWomen Emerging Leaders – from 16 countries in the Middle East and Africa since 2011. We are building on the success and structure of the “Notable Women in Computing Card Deck” that Jessica and I developed with Professor Susan Rodger (Duke University) to develop this new deck honoring global women of STEM. TechWomen is a professional mentorship and exchange program developed in response to President Obama’s efforts to strengthen relations between the United States and the Middle East and North Africa. Former Secretary of State Hillary Rodham Clinton first announced the TechWomen initiative on April 28, 2010 during President Obama’s Entrepreneurship Summit. In June 2011, TechWomen launched with 37 participants from Algeria, Egypt, Jordan, Lebanon, Morocco, and the Palestinian Territories. 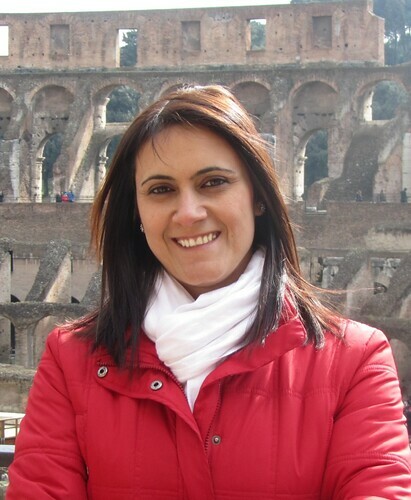 In 2012, the program expanded to include women from Tunsia and Yemen. In 2013, the cohort doubled in size with the addition of women from Cameroon, Kenya, Libya, Nigeria, Rwanda, Sierra Leone, South Africa, and Zimbabwe. TechWomen is an initiative of the U.S. Department of State’s Bureau of Educational and Cultural Affairs. The card design above is Jessica’s first draft proposal – still under discussion! 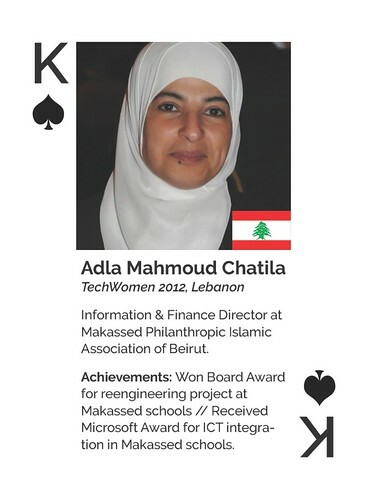 It honors my 2012 TechWomen mentee and friend: Adla Chatila of Lebabon. This project is a labor of love for the women behind it, which is why we are licensing the card deck under Creative Commons Attribution-NonCommercial-ShareAlike 3.0 U.S. License. We will make $0 profit from this project. We are still discussing how to fund production. Thanks to the 70+ TechWomen Emerging Leaders who have already submitted their information to be considered for inclusion. I am very much enjoying my email communications with this inspiring and energetic group as we develop this exciting new project! It may seem odd to write about diversity at a conference of 1,300 women and just a few men; however, in many dimensions the Hopper attendees were impressively varied. I particularly noticed this at the Systers lunch. I shared my table with women from Morocco, Mexico, Russia, India, China, and America. There were women who were older and women who were much younger. Many were just starting their career and others were over twenty years into it. Some were rich and others were students. was remarkable for the complex elegance of her personal presentation: it was worth looking for her in any crowd. by saying that gender discrimination was alive and well: when he went to register for the Hopper conference, the woman at the desk asked if he didn’t mean to be at the Grocer’s convention, next door.